Yoga is the most ancient and holistic system for physical, mental and spiritual well-being in the world.This system includes lifestyle practices to help an individual understand his or her identity and relation to the world. It is a complete lifestyle system that includes exercises, breathing practices, diet and meditation. Yoga exercises (asanas) form a preliminary part of the yoga system that help a person achieve a healthy and fit body to subsequently help the individual to focus on other higher branches of the yoga system such as meditation and self realization. Yoga exercises have become a mainstream means for physical activity in today’s society with a number of classes and styles popping up across the board. The exercises starts from basic breathing techniques to advanced poses. Whatever the exercises might be, there is plenty of variety for all age groups from beginners to advanced. 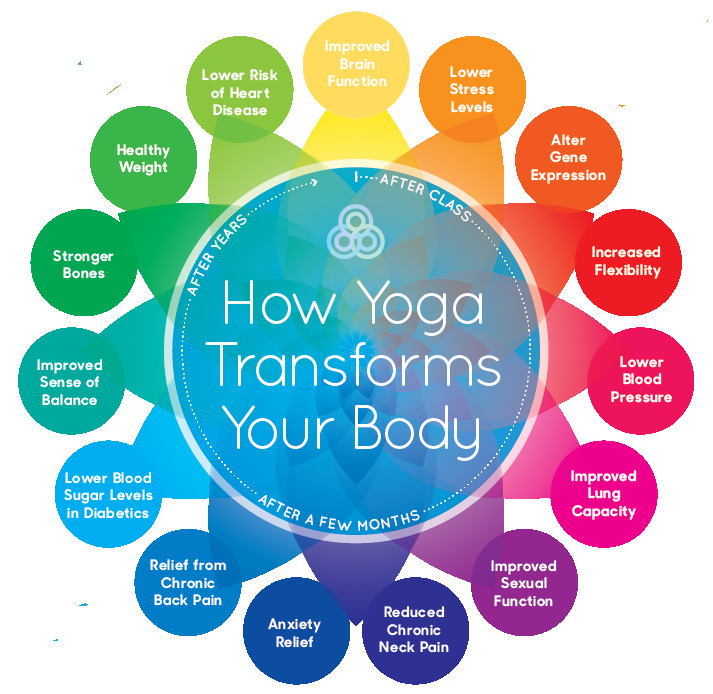 Whether you want to try out yoga to boost your physical activity, to learn to have greater focus, or to relieve stress, there are many benefits from yoga exercises that will extend beyond the mat. If you’re looking to increase strength and build lean muscle mass, yoga is a great option. Instead of lifting weights for your strength training, yoga uses your own body weight to help build muscle. By putting your body into various poses where you need to support your own body-weight, it is easy to add to your existing strength with Yoga. Most Yoga classes will increase your flexibility as you learn to bring yourself to your edge and go deeper into the stretches and poses within the yoga sequence. Through an increase in flexibility and range of motion, blood flow can then more readily reach all areas of the body. This successfully flushes out toxins and provides nourishment where your body needs it the most. Finding balance both physically and mentally is a requirement for many of the poses that are held throughout a yoga sequence. When you go to hold a balancing pose in yoga it is useful to find a point of focus where the gaze rests (drishti). During yoga poses, once the drishti is found, you can move slowly and mindfully into your yoga pose. This mindful movement encourages and develops balance both as you enter the pose and as you hold yourself there while softening the gaze on a point of focus. The practice of yoga asanas requires physical concentration as you learn to bring your focus to your breath and move through a sequence of poses. Bringing in an awareness of your body and breath is a useful tool that can be used off the mat as you increase your concentration in your day-to-day activities. As you learn to concentrate on your breath during your yoga practice, you will also bring your awareness to the present moment – releasing thoughts about the past and future. This practice is one that is developed over time, however, clarity and calmness of the mind is often developed when we can release the nagging thoughts that come from our busy lives. Instead of getting enveloped by the to-do lists and stresses of daily life that flood our mind, the practice of yoga helps us observe our thoughts and release that which is not serving us well. According to a study on the effects of meditation, when we engage in meditative practices we are actually rewiring the neural pathways in our brain. As you meditate, the neural connections between these two areas of the brain begin to loosen. After meditation, when there is a fear response induced you no longer will have such strong neural pathways that tie that sensation to you – meaning that you will be able to more clearly see the problem for what it is without automatically thinking that it is your fault or you are the problem – and as a result reducing anxiety.